The T20I series between India and Australia has ended on level terms after the final match in Hyderabad was abandoned. Despite no rain in the city, the officials decided against having the match and left the 30000 odd fans disappointed. 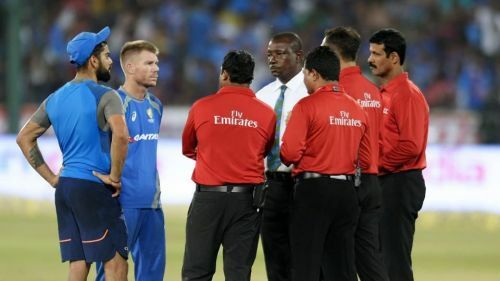 The two captains Virat Kohli and David Warner, umpires and match officials decided that no play could be possible because of a soft outfield. The reason for the abandonment was due to the poor nature of the outfield. Hyderabad has seen a lot of rain over the past few days due to which the outfield was constantly wet. The weather has been so overcast and cloudy over the past week or so due to which the sun itself did not come out. Due to this, in an unorthodox attempt to dry the outfield, three pedestal fans propped up by plastic chairs were aimed at a particularly wet patch on Thursday. The ground staff worked tirelessly in the hours preceding the match but were unable to get the ground ready in time. The outfield was in such poor condition that the ball itself was sticking into the ground. The players and officials were also finding it hard to walk on the ground. After the series, India remain 5th in the T20 rankings while Australia remain in the sixth position. The weather has been one of the main talking points throughout the series as there was a rain threat in all the ODIs and T20Is. However, all the matches were held without much disturbance with the Duckworth-Lewis method being used only once. After a successful outing against Australia, the Men in Blue will now take on New Zealand in a three-match ODI series and a three-match T20I series which begins on October 22 at the Wankhede Stadium in Mumbai. Following the New Zealand series, India will take on Sri Lanka in three Tests, three ODIs, and three T20Is which begins on 16 November. India's extended home season will finally end at the beginning of 2018 when India will travel to South Africa for three Tests, six ODIs, and three T20Is.